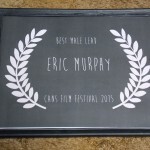 On November 28th, 2015, Motive Direct participated in the first annual Cans Film Festival. The festival was put on by QC7D winner, Jeremy Wernli and fellow independent filmmaker, Devon Presley along with the Princeton Players Theater Group. 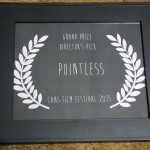 The event was free to public and all that they asked for was a canned good donation in return, hence….”Cans” Film Festival. All of the canned goods that were received were donated to the Princeton, IA food pantry. This festival only showed local filmmakers work, which consisted of Student Films, and non Student Films. It also featured art work from local grade school students. It was a lot of fun, and hopefully this festival will continue into the future….as its for a great cause! As for the winners…..well, I don’t remember all of the winners, and I apologize for that. Motive Direct did however take home 2 awards this time.